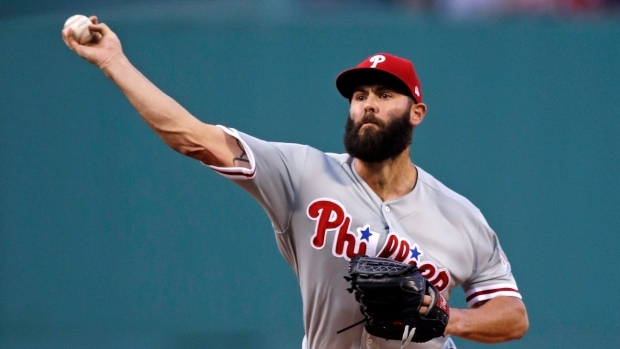 CLEARWATER, Fla. — Jake Arrieta has no doubt the Philadelphia Phillies will be successful this season. Philadelphia opens at home Thursday against NL East champion Atlanta. The Phillies transformed during the off-season, signing right fielder Bryce Harper to a $330 million, 13-year contract after adding left fielder Andrew McCutchen, shortstop Jean Segura and catcher J.T. Realmuto. Harper doubled to left centre on a 95 mph fastball from Wilmer Font in the first and walked against Diego Castillo during the third. After starting 0 for 9, the slugger closed out spring training with four hits — including a double and two homers — in his final eight at-bats. "I think Harper caught up pretty quick," Arrieta said. "He's one of the brightest stars in our game. If he stays healthy and is on the field for us, he's going to put up some great numbers." In his final plate appearance, Tampa Bay used a defensive alignment shifted toward the opposite field that left a large hole between first and second base.